The Association of Community Rail Partnerships will be holding its annual general meeting on the 13 December 2018. Attendees will learn out more about the ACoRP’s activities in 2017-18 and plans for 2018-19. We will also have a guest speaker with Andrew Leo from the West Midlands Rail Executive talking about their plans for community rail in the region. The event will be taking place at the Church at Carrs Lane in Birmingham City Centre (please see map at the bottom of this page for further details and directions). The event runs from 13:45 for 14:00 until approximately 16:30. All ACoRP members are welcome to attend. A meeting agenda can be downloaded below. 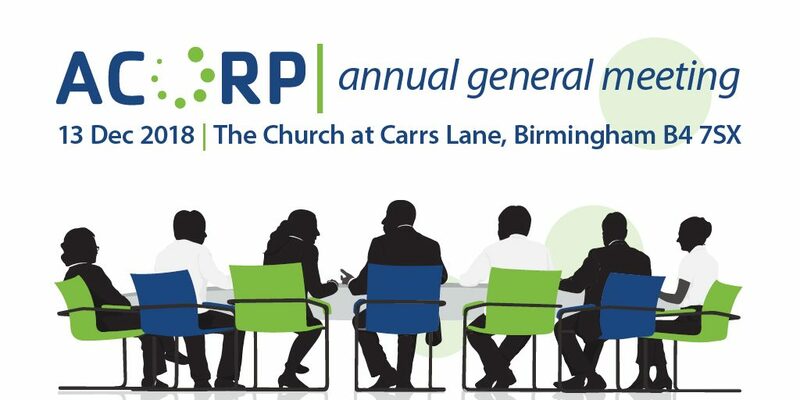 As well as the formal business of the AGM there will be a presentation from ACoRP’s Chief Executive Jools Townsend on the work of the organisation over the past year along with a discussion on next year’s plans. Voting will also be held for members of the ACoRP board. There are nine candidates standing for six vacancies – Marion Atkinson (Borderlands), Andrew Backhouse (Crewe-Manchester), Daisy Chapman-Chamberlain (West Lancashire), Barry Coward (North Notts & Lincs), Heather Cullimore (Severnside), Melanie Lawton (Conwy Valley), Kaye Robinson (Poacher Line), Jeremy Whitaker (Individual member) and Claire Williams (Cambrian Line). Click on a name to view their personal statement. If you cannot attend the AGM but wish to vote, you can request a proxy form using the form below. All applications for proxy votes must be made by midday on 10 December 2018. Proxy votes must be received by midday 12 December 2018. To confirm your attendance, send your apologies and request a proxy form, please complete the event registration form below.